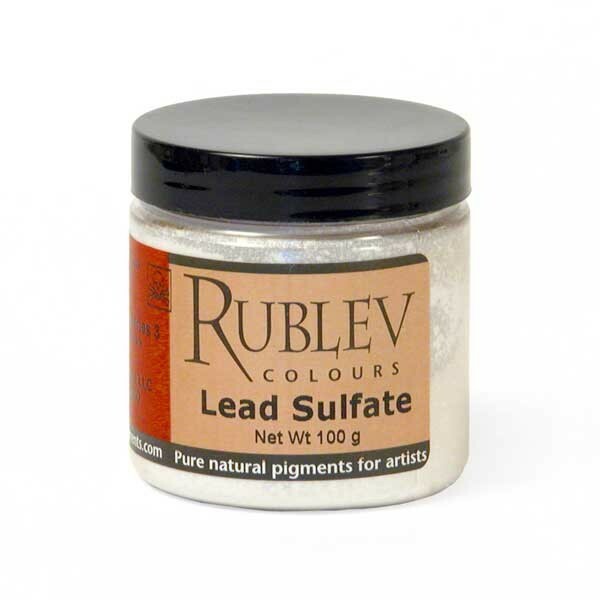 Rublev Colours Lead Sulfate is a bright white powder suitable for use in most media, but especially adapted for oil; it is tetrabasic lead sulfate. Rublev Colours Lead Sulfate is made by a modern process yielding a finely divided white powder of high purity. Lead sulfate (British spelling, sulphate), PbSO4, formed the basis of a number of white pigments that were made on a large scale in the 19th century and 20th century and sold under a variety of names, such as "Patent White Lead," "Non-poisonous White Lead," "Sublimed White Lead," etc. Some of these pigments did not consist entirely of lead sulfate but contained other minerals, such as zinc oxide, barite (barium sulfate), magnesia (magnesium carbonate), etc., in varying quantities. They were made by different methods and most of those sold were produced by patented processes. One of the first patents to show the use of lead sulfate as a pigment was given to William Cumberland of New York in 1838, U.S. patent number 767. In the 19th century, three basic methods were used to prepare lead sulfate. The first method consisted of precipitating a soluble lead salt (lead acetate or lead nitrate in dilute solution; perhaps the best method is the one where lead acetate is used) with dilute sulfuric acid, the dilute acetic acid obtained in the supernatant liquid being used over again for dissolving metallic lead. A variation of this process was done by grinding litharge with one-fourth its own weight of common salt and treating the mixture with sulfuric acid. Lead sulfate was also obtained in large quantities as a by-product in the manufacture of aluminum acetate from lead acetate and aluminum sulfate. The second method was obtained by roasting a mineral containing zinc sulfate and lead sulfide ore—lead oxide and lead sulfate being formed in the process—the product known as 'sublimed white lead' (Bartlett Lead). The fumes containing these products and zinc oxide were collected in chambers provided for the purpose. The product obtained in this manner was subjected to complex treatment. The composition of this product tended to be somewhat irregular; the shade was not always pure, being a bluish gray tint to white. 'Non-poisonous white lead' or patent white lead, and 'sublimed white lead' are mainly composed of lead sulfate with small amounts of lead and zinc oxides. The last-named is a basic lead sulfate with some zinc oxide. Grinding precipitated lead sulfate with zinc oxide and perhaps other compounds under edge runners was a third method of obtaining lead sulfate. 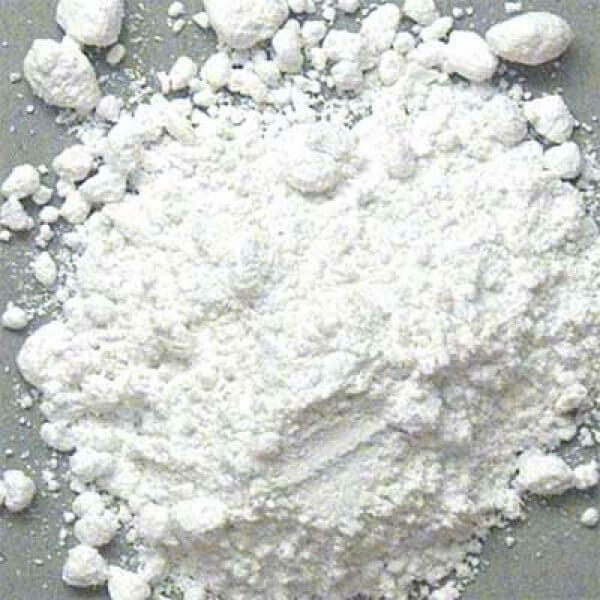 Freeman's White Lead was a mixture of lead sulfate, zinc oxide, magnesium carbonate and artificial barite (also called blanc fixe) obtained in this manner. The naturally occurring mineral anglesite, PbSO4, occurs as an oxidation product of lead sulfide ore, galena. A number of lead sulfates are known: PbSO4·PbO; PbSO4·2PbO; PbSO4·3PbO; PbSO4·3PbO; PbSO4·4PbO; the first two are most commonly used in the paint industry along with a mixed pigment containing zinc oxide and barium sulfate. Three methods of modern manufacture for lead sulfate pigments were used in the 20th century. The first was the formation of lead sulfate as a component of the mixture of zinc oxide and lead sulfate based on earlier methods made from ores through sublimation in controlled atmospheres. Second, in 1935, a new basic lead sulfate was made by precipitation that gave improved properties and higher basicity, but proved to be uneconomical and was abandoned after 1960. The third method, and one which produces most lead sulfate today, is formed by a fume process where molten lead is atomized in a jet flame in the presence of excess air and sulfur dioxide. Most of the lead sulfate today is used in manufacturing the active paste for lead acid batteries. Lead sulfate pigments were sold under many trade names and it is not always clear whether they refer to the basic form. These include fast white, milk white and Mulhouse white for lead sulfate (Colour Index Pigment White 3), and basic sulfate white lead, Lewis white lead, sublimated white lead and white lead sulfate for basic lead sulfate (Colour Index Pigment White 2). A lead carbonate sulfate mineral, leadhillite (PbSO4·2PbCO3·Pb(OH)2), was identified in pigments from the Tiantishan Grottoes, China. Lead sulfate pigments have been identified as artists pigments in 13th to 16th century Chinese paintings. It is also believed to have been used as a white pigment by late 18th century and early 19th century British watercolorists. George Field named lead sulfate "Flemish white" in his treatise Chromatography, while another form including zinc white and barite was sold under the name, "Freeman's white." Rublev Colours Lead Sulfate is tetrabasic lead sulfate made according to the modern fume process, resulting in a brilliant white powder of high purity. Lead sulfate is a white, somewhat crystalline, very heavy powder; its specific gravity being about 6.3. It is only slightly soluble in water, insoluble in dilute acids and in alcohol, but soluble in solutions of ammonium salts and in strong sulfuric acid. Boiling concentrated hydrochloric acid dissolves it and crystals of lead chloride fall down as the solution cools. It is not readily acted upon by hydrogen sulfide, and is therefore, more permanent than lead white when exposed to air polluted with it. Owing to its solubility being less than basic lead carbonate, it was often sold as "nonpoisonous white lead." Lead sulfate, according to Georg Zerr and Robert Rübencamp, is a color of 'dazzling whiteness.' Its color is a good white, but slightly yellower in tone than lead white and about equal to barite (baryte). The hiding power of lead sulfate pigment is less than lead white on account of its more crystalline nature, and its drying quality is also less. Lead sulfate is either a neutral pigment of crystalline structure with poor hiding power or a basic pigment with better opacity but less than basic lead carbonate. Compared to basic lead carbonate it does not mix as well with oil. According to Laurie, lead sulfate prepared by precipitating the lead salt with sulfuric acid had poor covering power but that produced by sublimation gave the best pigment. It was a pure white, slightly 'blue in color and covering as well as white lead.' Lead sulfate was less used alone than in mixtures with and shading other pigments. Lead sulfate is unaffected by light. Lead sulfate is little affected by hydrogen sulfide found in air pollution. It was developed for use in outside house paints, because it did not have the same tendency to darken when exposed to pollution containing hydrogen sulfide. When applied in watercolor technique, however, traces of hydrogen sulfide in the air may cause it to darken. Although lead sulfate is theoretically incompatible with sulfide pigments, and should form black lead sulfide in contact with them, no examples are readily known. Basic lead sulfate absorbs a small quantity of oil, requiring 22 grams of linseed oil for 100 grams of pigment to form a paste. It grinds well with linseed oil, but not as easily as does lead white (basic lead carbonate). Although writers in the 19th century often wrote that lead sulfate was non-toxic and hence gave the designation of 'non-poisonous white lead,' it is toxic if inhaled as a dust or if ingested. It is a cumulative poison, and repeated exposure may lead to anemia, kidney damage, eyesight damage or damage to the central nervous system (especially in children). Grinding and making the pigment into paint can be hazardous and the sale of lead compounds in some countries has been prohibited. Painters may suffer from "painters' colic" or "plumbism" if they are careless in using it. Care should always be used in handling the dry powder pigment so as not to inhale the dust. Do not smoke, eat or drink while using the pigment in any form, including in paint. WARNING! Contains Lead. Read the MSDS for cautionary statements.